As in the previous game, you play as Rico Rodriguez, now officially a dictator removal specialist (says the intro credits) and more or less a superhero in all but name. This time, you arrive in Medici, Rico’s country of origin, to remove General Di Ravello, the despot currently ruling this Mediterranean paradise with an iron fist. Because a paradise it is, at least visually. Explosions have the right blend of orange flame and dirty smoke, and the sunlight reflects beautifully off metallic paint on the game’s many vehicles. In particular, the water effects are magnificent, with large, physical waves out in the open ocean that both look good and can throw your boat around every which way. Red stripes? It has to go. Talking extensively about the story and graphics of a Just Cause game, however, is kind of like reviewing a book cover instead of the book. It’s not unimportant, it’s just drastically missing the point. So let’s delve into the gameplay – the heart, soul, and focus of the series. 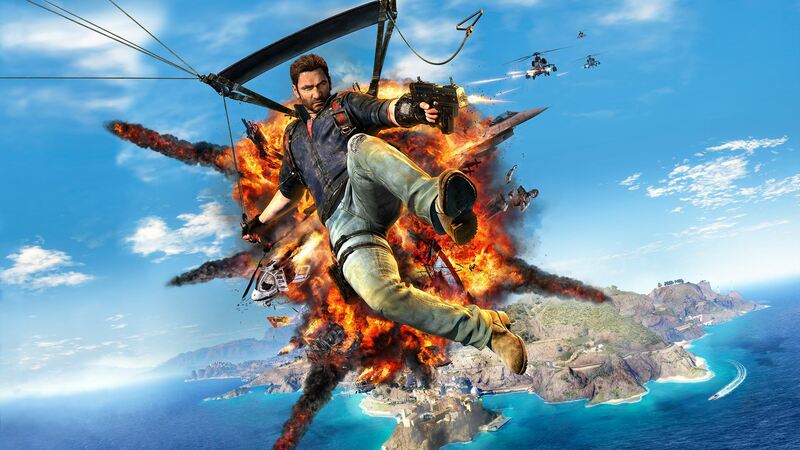 If I were to explain the game in just a few words, I’d say that Just Cause 3 is a primarily a game about explosions, and secondarily a game about mobility. Let’s talk explosions first. As players of the previous games are aware, the way to remove dictators is to destroy (by which I mean “blow up in spectacular fashion”) everything adorned with red stripes. Transformers, radio towers, propaganda trucks, fuel tanks, small satellite dishes, gigantic satellite dishes – everything needs to go. If you destroy all the red‐​striped objects in a so‐​called “settlement”, whether a small town or a huge military base, the number in the top left of the screen reaches 100 and you get a nice fanfare and an info screen saying you’ve liberated this settlement. There are, if you’re so inclined, 130 settlements to liberate, divided into 29 provinces and spread across 3 huge islands. It’s no wonder, then, that exactly how much you’ll enjoy this game is largely determined by whether or not it allows you to make things explode in interesting ways. Thankfully, it does, but before going into detail, let’s take a detour into mobility‐​land so we can introduce Rico’s superpower, the grappling hook. I guess that was a helicopter, though it’s hard to say for sure. With over 1000 square kilometers in which to frolic and romp, much of the time is spent simply getting around. Like with Just Cause 2, there is no lack for ways to travel in this game. You can use every vehicle you come across, whether a car, truck, racing boat, fishing boat, helicopter or fighter jet. All the civilian vehicles can be brought to the many garages you unlock to “scan it”, allowing you to request it in an aerial drop anywhere and anytime (to slightly comic effect when you order the giant Hercules‐​esque cargo plane and it pops out from the same small cargo container as everything else). Military vehicles, most with powerful weapons with unlimited ammo, are unlocked by liberating military bases and as part of the story. 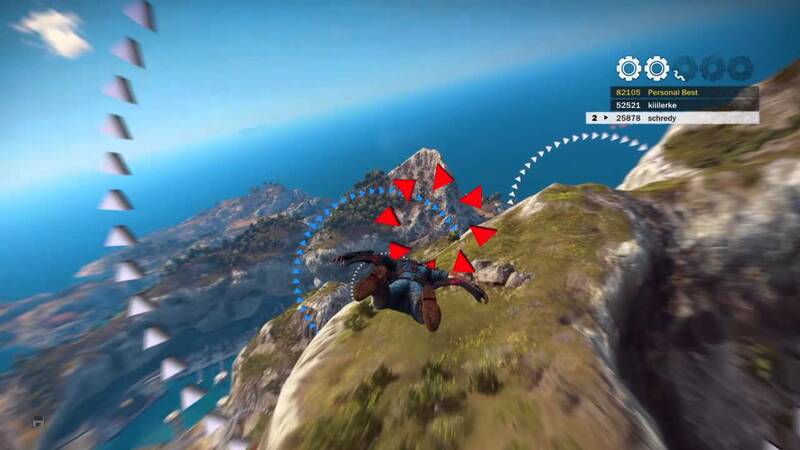 On top of that, you have fast travel, which drops you skydiving off a helicopter high above a chosen settlement. Vehicles, however, often seem kinda pointless. As in the previous game, you are equipped with a parachute and a grappling hook. 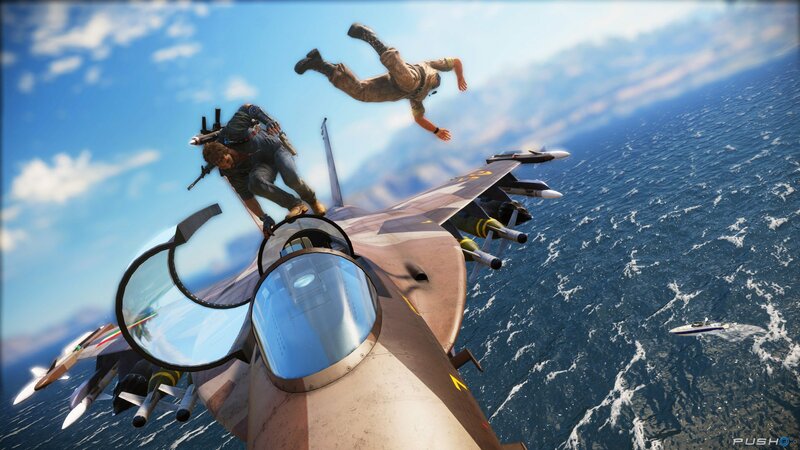 The grappling hook allows you to pull yourself towards anything and attach yourself to walls and ceilings (“ceilings” including the underside of helicopters, mind you). Furthermore, it provides a means of propulsion for the parachute (and a very powerful one at that, at least with an early upgrade). And when you can rapidly grapple‐​chute your way around the world, why would you want to grab a car and be limited by roads? And with the new fast travel option, why would you want to call the rebels and have a jet delivered, and fly across the huge map for five minutes, when you can just fast travel there and jump right into the fray? Even military helicopters gets much less use than you would think due to the prevalence of powerful anti‐​air missiles near all military bases and outposts. Yes, you can hijack vehicles in mid‐​air. Though what the car is doing there in the first place is anyone’s guess. While getting around effectively is a plus in and of itself, the lack of time spent on foot (and indeed at any sensibly low speed) makes it difficult for the game to present anything with a sense of scale. Walking around on an oil rig or in a city can indeed give you a feeling for just how big many of the game’s locations are, but A) you really have to put your mind into deliberately slowing down, and B) walking around is a surefire way of getting yourself killed when you’re in a fight. I’d guess less than 5% of my time with the game was spent walking or running, instead relying on grapple‐​chuting or using the new wingsuit. Even in close firefights, you’re much better off grappling around from wall to roof to wherever, or flying with your parachute and raining down destruction from above (even the loading screens make a point of this). Having now introduced the grappling hook, let’s return to explosions‐​land again and talk about the plethora of ways you can actually blow stuff up. The grappling hook has received a significant upgrade since the previous installment, and is now an even more versatile and fun toy than before. The “old” grappling hook only allowed you to reel yourself in and to shoot out a tether to attach two objects to each other. Now, firstly, you can use several tethers simultaneously. Secondly, you can press a button to retract the tethers, pulling the attached objects towards each other. This simple change opens up a whole new world of possibilities. Tethering a giant fuel tank to a wall to pull it out of its place and make it explode? Check. Tethering several guys to said fuel tank before blowing it up? Check. Tethering an annoying chopper to the ground, or to something explosive, and pulling them together to bring both to a fiery end? Check. Tethering an explosive barrel to a much heavier tank, flinging the barrel toward it? Check. Tethering the tank to a wall, pulling it up and leaving it helplessly hanging there? Check. Annoying enemy? Tether him to a tank like this and shoot off the cap, and away they go. You can also attach yourself to it and catch a free rocket ride, just remember to abandon ship before it explodes. 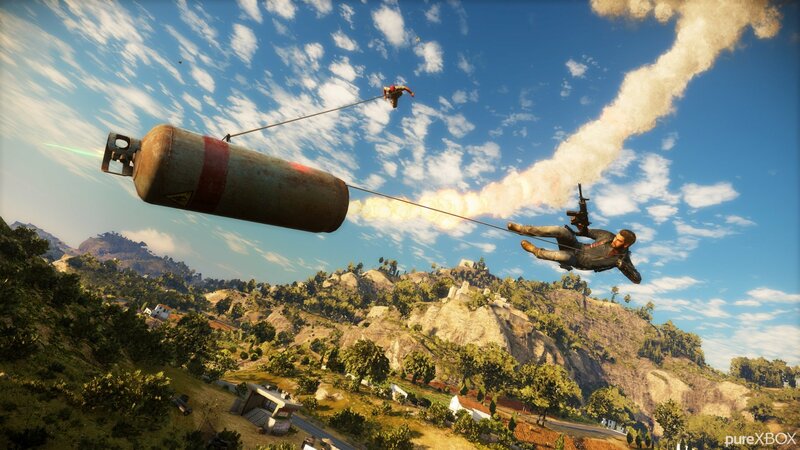 The possibilities are endless, and pulling off new and inventive tether stunts are truly rewarding – much more than simply using many of the guns, rocket launchers, grenade launchers and shoulder‐​mounted nukes the game has to offer (and those are fun too, so that says a lot). The grappling hook truly feels like a superpower in this game – almost like if you’re using the Force to pull objects into each other. Unfortunately, you don’t always have the time to really think and plan your grappling to pull off awesome stuff, because if you stand still (by which I mean “move at less than 50 km/​h”) too much in a firefight, the numerous and constantly‐​replenishing enemies will surely get you. I’d like for the game to hold back the number of enemies and reinforcements a bit, in order to allow you to experiment more with new ways to combine the grappling hook with all the explosives present in military bases. In this manner, Just Cause 3 is like a sandbox with those annoying bullies who constantly show up to knock down your unfinished castle. You do get as many chances as you like, though: After completing the story, you enter a “sandbox mode” where you can re‐​oppress settlements in order to liberate them blow them up all over again. That’s a nice touch! While it’s fun to blow stuff up – even huge bridges can be blown up this time around – there’s no getting away from the realization that the world is rather monotonous. Sure, a village is decidedly different from a military base, and there are differences between military bases and outposts, but with few exceptions, all the settlements feel the same as their brethren in the same category. This certainly isn’t Skyrim, where every detour is an opportunity for a new adventure; instead, it seems you’re barely meant to notice the world in between all the explosions and grapple‐​chuting. The skydiving challenges are called “Wingsuit Tours”, and they do indeed show off quite a few scenic views. Furthermore, even with new weapons and toys, liberating your 50th settlement feels much like the first: You destroy the same kinds of objects to get to 100%, and you’ve seen all the explosions before, because things explode in much the same way no matter how you destroy them. In general, as you progress, the game escalates by simply throwing more and tougher enemies at you. I’d like to see genuinely new challenges or content instead. This lack of variation is somewhat alleviated by Challenges. They are unlocked when you liberate a nearby settlement, and come in a variety of types. Naturally, you’ve got your races (both air, sea, and land), but also wingsuiting courses, destruction frenzies (in which you’ll blow up a military base all over again using a certain weapon or vehicle), kamikaze‐​style land‐​vehicle bomb runs, and even challenges where you’re driving around a base collecting minerals with a magnetic device tethered to your vehicle. Challenges show off much of the game that you might otherwise have missed. 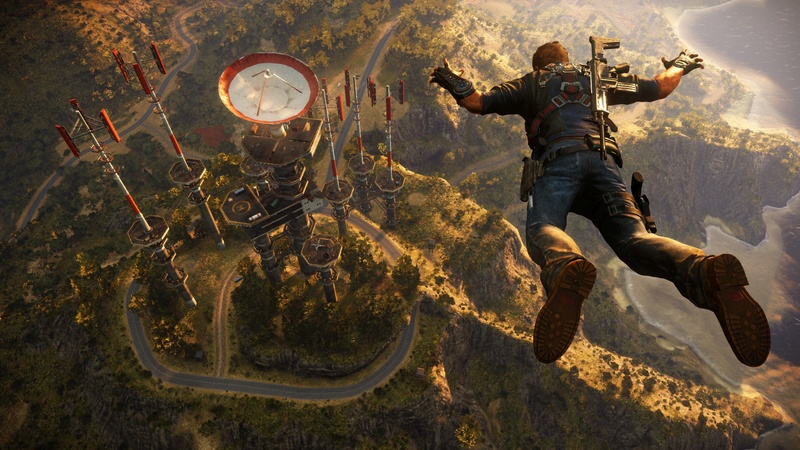 Memorable challenges include a race down a narrow mountainside road with a precipitous drop off to one side, as well as several wingsuit courses through the various canyons and crevasses down from the tallest mountain in the game (or through road tunnels and natural caves, for that matter). Completing Challenges rewards you with “gears” in a certain category, which unlocks a linear progression of upgrades you can turn on and off to upgrade and change your equipment and abilities. For example, land racing unlocks nitrous and other upgrades for land vehicles, destruction frenzies can give you the ability to have homing grenades or grenades that explode on impact, and bomb‐​run challenges can give you the ability to turn your remote explosives into rocket boosters (a fun upgrade when messing around, though sadly less useful when attempting to destroy a base). Want a jet fighter? Just grapple onto one and throw out the pilot. I’m sure he’ll understand. All in all, the Challenge system and its rewards works well, though I’d prefer to have a few of the upgrades available much sooner. For instance, the “rocket booster” remote explosive mod is decidedly most fun after the second upgrade, which makes them much more powerful, but you don’t get that until late in the game. Of course, the game sports a couple of different types of collectibles, but thankfully that’s not forced on you in any way, and collecting them actually gives you tangible rewards. For example, you can collect all the weapon parts in each region to unlock an interesting weapon, speed off all the so‐​called Daredevil Jumps to get a unique vehicle, and collect Di Ravello’s journal tapes to get the story of his rise to power. In light of the challenges, I must mention the mandatory online leaderboards. Forced online content in single‐​player games is a surefire way of getting on my nerves, especially if the connection is unstable. I don’t give a rat’s behind that BieberFAN94 has a higher parachute climb than me or that some_​guy123 raced better than me in this or that race, yet still the game insist on telling me when I start playing, after a lengthy “Connecting to online servers” loading screen I’d rather be without. I’ve also experienced (though thankfully no more than twice) the game suddenly losing contact with the server, which took a minute or two reconnecting. The online features haven’t been a huge problem for me, but as always, it’s really annoying that you’re forced into this even in a single‐​player game. 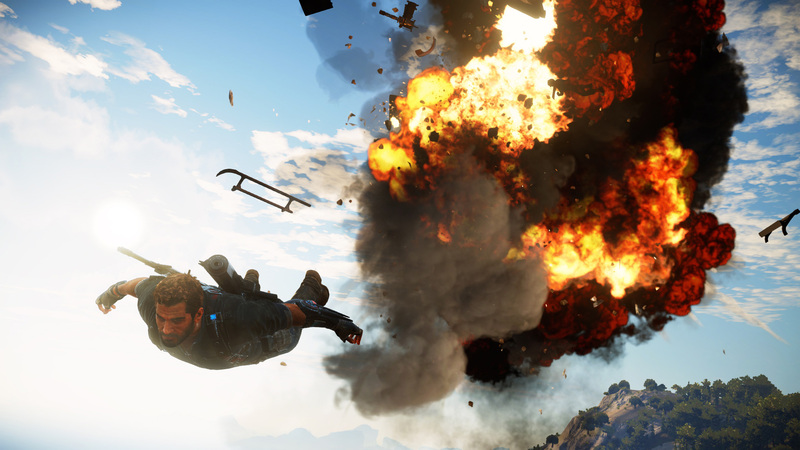 Just Cause 3 is a fabulous game for when you just want to jump into the sandbox and blow stuff up in spectacular fashion. 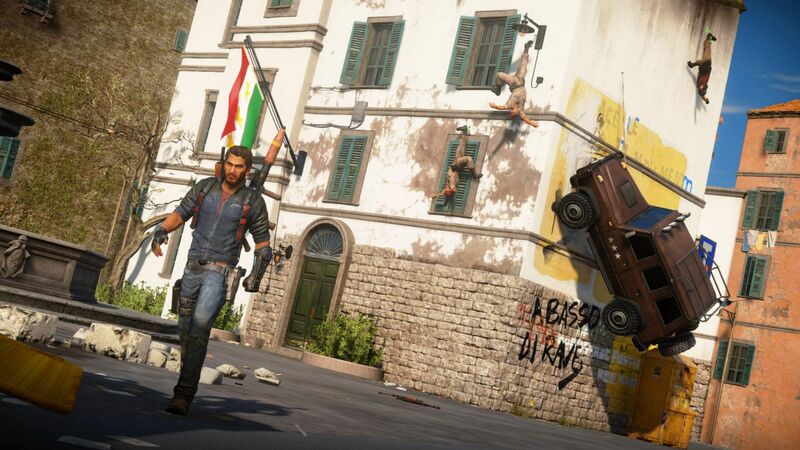 Whether you want to attach rocket booster bombs to enemies or blow up a bridge and watch train after train end up in an exploding pile in the canyon below, Just Cause 3 has you covered. Things do get a bit “samey” after a while, and the game could have done more to encourage experimentation with tether‐​based destruction. Still, it’s great fun, the lack of variety is somewhat offset by the challenges, which will also provide you with interesting upgrades. 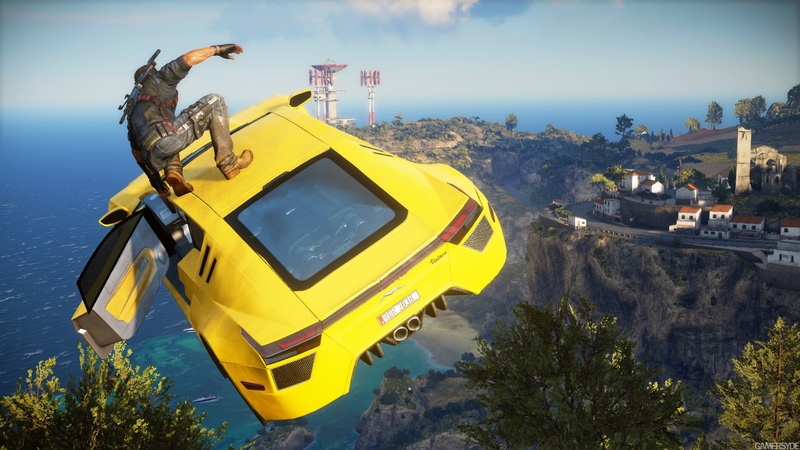 Just Cause 3 is best in small doses. I normally played for sessions of more than an hour, and often many days in a row, and though I was never truly bored, I became numb to the mayhem‐​based charm the game seems to be built on. This is decidedly not a game about getting to the end; it’s a game about childlike play in the sandbox, and you’ll likely have a better experience with it if you keep that in mind. Ingested in bite‐​sized chunks, Just Cause 3 is a good game. Its main drawback is that is lacks a bit of variety, but there’s so much fun to be had just messing around with the grappling hook that I’ll still recommend it to anyone who likes explosions and pointless sandbox‐​style play.